Politics • Johnson, McMullin trying to garner more votes after latest Trump controversy. 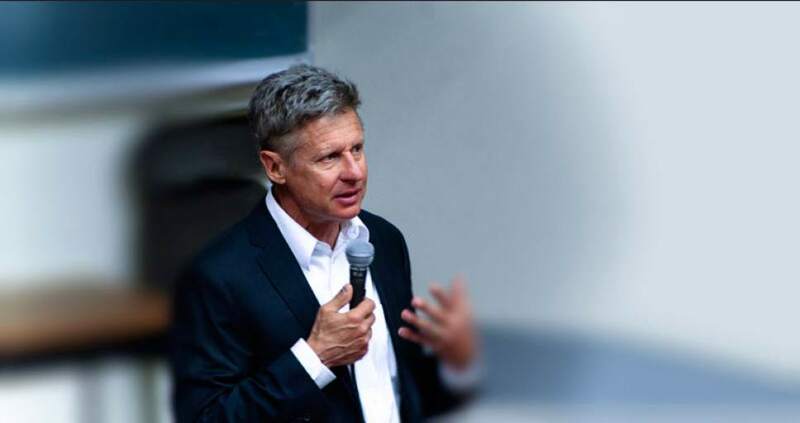 | Courtesy Gary Johnson is the 2012 Libertarian Party nominee for president who is again running for his party's nomination from a Salt Lake City campaign headquarters. 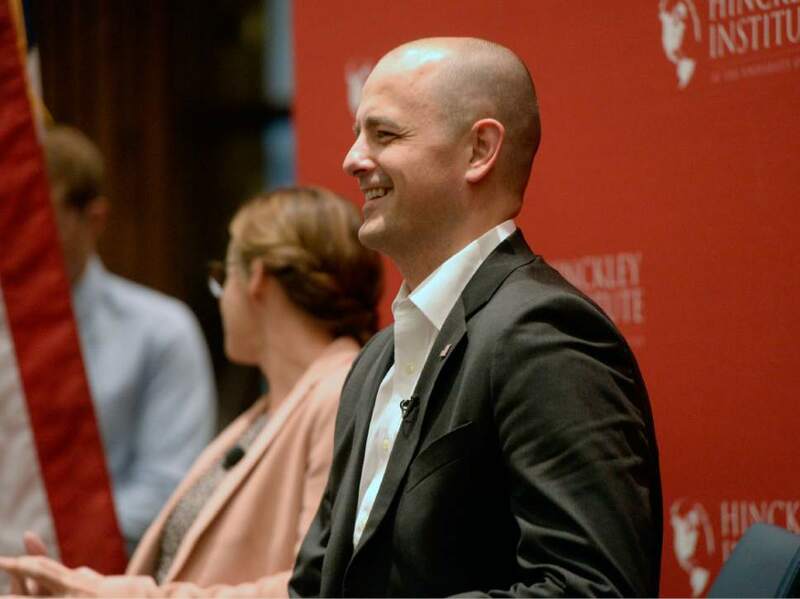 Al Hartmann | The Salt Lake Tribune Evan McMullin, a conservative independent presidential candidate, appears at the Hinckley Institute of Politics at the University of Utah Wednesday September 1. Decades ago and only after drinking a few beers, Gary Johnson, the Libertarian presidential candidate, may have said some things about women he wouldn&apos;t want the world to know about, but he points out he&apos;s never uttered anything nearly as inappropriate as Donald Trump. Johnson, the former Republican governor of New Mexico, and independent conservative Evan McMullin are trying to scoop up the support of Utah Republicans upset at the 2005 video showing Trump, then 59, boasting of kissing and groping women without their consent. They see an opening in the Beehive State after high-profile state leaders, including Gov. Gary Herbert and Rep. Jason Chaffetz, vowed not to vote for their party&apos;s nominee. Johnson told The Salt Lake Tribune on Monday that Trump&apos;s bawdy talk with Billy Bush, then from "Access Hollywood," is at the top of the list of "150 things" the GOP nominee has said that should disqualify him from running for president. "I have never said anything like that," Johnson said. "When I was 21 years old or 18 years old maybe, after a few too many beers with my buddies ... but even then I didn&apos;t approach this kind of speech and, of course, I didn&apos;t have a microphone on and I wasn&apos;t 59 years old. "I think I have been pretty darn rock steady for 45 years. I get back to those 17, 18, 19, 20 … there were some learning experiences, but that&apos;s been a long time ago." Asked what he was referring to, the 63-year-old Johnson said: "Just that I may have engaged in locker-room conversations when I was 18 or 19 years old that really does not reflect who I am or what I am today, but nothing that approaches what Trump said." McMullin, 40, said he&apos;s been part of these so-called "locker-room conversations," but that doesn&apos;t describe what Trump did. "Most men might talk about a beautiful woman they have seen or something, but to say you would grab their private parts and you can get away with it because you are famous and to use the words that he used like that, I don&apos;t think most men actually do that even on their worst day," he said. "But I think it is very normal for Donald Trump." McMullin, a Utah native who has worked for the U.S. House, the CIA and Goldman Sachs, called it "vile and unacceptable behavior for any man and certainly not acceptable for someone who would seek to lead this country." "It is not just about the words he used, but what he says he does. It is nothing short of sexual assault in my mind." Not mincing words, McMullin said: "Donald Trump and his candidacy are evil." He argued that Republican leaders nationwide should uniformly reject Trump and that not doing so shows a "crisis of leadership" within the party. Many of Utah&apos;s elected Republicans disavowed Trump after the video. Beyond Herbert and Chaffetz, Sen. Mike Lee and Reps. Chris Stewart and Mia Love have all said he should withdraw from the race. Sen. Orrin Hatch, Rep. Rob Bishop and Utah Republican Party Chairman James Evans are among those sticking with him. "Donald Trump has apologized for his comments 11 years ago when he was in the environment of Hollywood and the political left," Evans said in a statement Monday. "We condemn the degradation of women in any form and condemn the comments he made in this recording. However, I accept Mr. Trump&apos;s profession and trust he is demonstrating the change in his heart today; and I support him as our Republican nominee." Evans also said he was "confident at the end of the day Utah will support Donald Trump for president." Johnson and McMullin plan to focus more attention on Utah in the coming days in hopes of taking advantage of this controversy in a state that has already shown a willingness to consider their candidacies. The most recent Salt Lake Tribune-Hinckley Institute poll, from mid-September, had Trump at 34 percent, Democrat Hillary Clinton at 25 percent, Johnson at 13 percent and McMullin at 12 percent.